LOUISVILLE, Ky. — The oldest living jockey to win the Kentucky Derby is back in town hoping to figure out something that has bugged him for years. In 1936, Ira Hanford rode 20-1 long shot Bold Venture to victory, beating favored Brevity by a head and becoming the first apprentice jockey to win the race. Now 88, Hanford has traveled from his Ocala, Fla., home to Churchill Downs for the first time since he won at 18 with his only Derby mount. And he’s got some questions. Hanford and two other jockeys in the 1936 Derby received 15-day suspensions. That prevented him from riding Bold Venture for trainer Max Hirsch two weeks later in the Preakness. He was replaced by George Woolf of Seabiscuit fame, who won. Bold Venture then lost in the Belmont Stakes. Hanford was notified of his suspension after he had taken the train back to New York, where he was riding at the time. The 1936 Derby had a rough start. Back then, the starting gate didn’t have front or rear doors to lock the horses in a somewhat uniform line. They were led in and stood there until a bell rang. Hanford looked to his right and saw Bien Joli standing at an angle and about a neck in front of him and Bold Venture. He called out to jockey Lester Balaski to straighten his horse. Hanford and Bold Venture careened to the left and into Granville, knocking jockey Jimmy Stout to the ground. By the final half-mile, Hanford had Bold Venture on the lead and they withstood Brevity’s late rush, rewarding bettors with a $43 win payout. 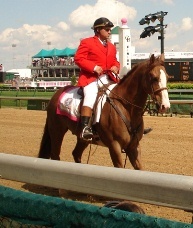 Hanford is one of 22 jockeys to win the Derby in his only appearance. He never rode in the race again because he didn’t have a horse worthy enough. He retired in 1953, after a brief gig on a then-unknown Seabiscuit, and became a trainer. Hanford says he never got a definitive reason why he was suspended. 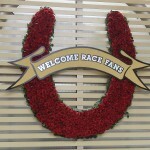 But Hanford can’t shake the feeling that the suspension was to keep him out of the Preakness. He doesn’t know why. “I’ve always thought that, and it’ll be pretty hard to change my mind,” he said. 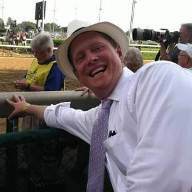 He bears no grudge against the current Churchill Downs stewards, who, of course, had no part in making the 70-year-old ruling. Black-and-white newsreel footage is all that exists of the 1936 Derby that was run in the days before instant replay and extensive filming of the race. “There was a lot of roughness in the race, but it wasn’t the riders,” said Hanford, nicknamed “Babe” because he was the youngest of 10 children. 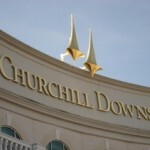 A few years ago, Churchill Downs invited Hanford back to the Derby, but he had other commitments. This year, Jane Dempsey’s Kentucky Derby Junket, a California company specializing in Derby tours invited Hanford to Louisville with Virginia, his wife of 64 years, and his 90-year-old brother Carl, who trained five-time Horse of the Year Kelso. Also along on the trip is John Sellers, who won the 1961 Derby aboard Carry Back. Hanford and Sellers placed their handprints in front of a downtown hotel Wednesday and planned to celebrate the anniversaries of their Derby victories with appearances at the track’s museum. Especially for those who only ride in it once.